Welcome To The BlueSmoke Gazette! A big hello and welcome to all of the new subscribers to the BlueSmoke Gazette. I would like to personally thank you for your interest in my newsletter. Get out your sunglasses and sunscreen, it's time to do some serious outdoor grilling and smoking! Today, we here in the Northern Hemisphere experience the summer solstice, the longest day of the year. It's also when serious heat starts to bear down on a lot of us...but I haven't experienced that yet here in my new home, 1800 miles away from the winds of Kansas. Here in Western Washington, the weather has been nice and cool. As I'm writing now, the outdoor temperature is 61 degrees, with a high predicted of 70 for the day. And goodness, Saturday we will be experiencing a heat wave. Eighty degrees is the predicted high. Ouch! I don't think I can take it! But wherever you are, be it hot, cool, or just right, I hope you have a great summer (and a great winter, to my Southern friends). Buy four nice, large white onions and some real butter. A little salt and pepper are the only other ingredients you'll need. Trim the root ends of the onions carefully...just take enough off to smooth up the bottom. Slice the top off of the onions, but leave on the dry skins. They'll protect the onions as they cook. Very carefully, cut out the center of the onion, without cutting through the bottom. If you cut through the bottom of the onion, it's ruined for grilling. Get another one and start over. It's how I built Smoker-Cooking.com. All the tools are provided for you to build a website that can earn you some extra money each month. Take advantage of the SBI trial. If you're not fully satisfied, you'll get your money back. 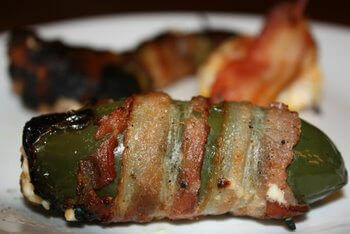 This recipe was inspired by my love of hot and spicy foods. The special ingredient that makes these so good is fresh-ground, homemade chili powder. To make Spicy Hot Ribs, start out with a Kansas City style slab of pork ribs. Other ingredients you will need are two tablespoons of homemade chili powder, two tablespoons of dried brown sugar, two teaspoons of vinegar, and six ounces of tomato sauce. Season the slab with two teaspoons of the fresh chili powder (don't worry, I'll give you the recipe for the chili powder, too). While the ribs are smoking, combine the remaining ingredients in a small saucepan and simmer for five minutes, then cover and remove from heat. Smoke the ribs at 225-250 degrees Fahrenheit until tender, then brush on the sauce. Give the ribs another half-hour in the smoker, then serve 'em up! Cold drinks all around for this one! This chili powder recipe is the secret that makes the hot spicy ribs so good. If you've never made any of your own seasonings from whole spices, this is a good place to start. An electric spice mill is one piece of equipment that you'll need. The larger chili peppers may need to be pre-ground in a blender. Large pieces may be difficult for some spice mills to handle effectively. The peppers must be dry enough to break easily when you bend them. I tried this grill recipe, and I tell you, it made the best tasting shrimp I think I've ever eaten. No lie! It's easy to prepare, and quick-cooking. All you'll need for this one is a hot grill, colossal shrimp, soy sauce, brown sugar and fresh garlic. A quick soak in the marinade and a few minutes on the grill is all it takes. Copper River Salmon is one of the richest, most flavorful salmons available. This recipe makes the most of the wonderful flavor of these fish. 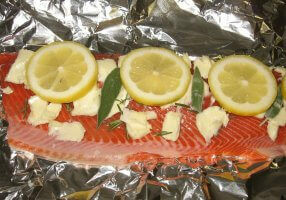 The fillet is grilled in a foil "fish envelope", and is seasoned with lemon, rosemary and sage. A little bit of butter is added for good measure. Thanks again for subscribing to The BlueSmoke Gazette, the official newsletter of Smoker-Cooking.com. Enjoy the Summer.